We all have chores to do and we have struggled all year to find a workable system for this season of life. Early this year I implemented a card and clothes pin system that works pretty well. 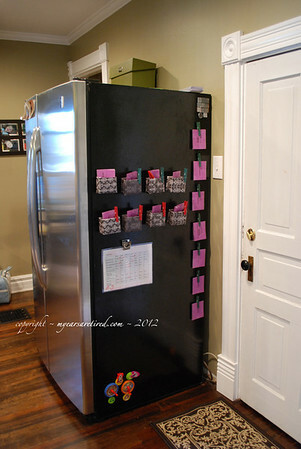 However, the clothes pins hang on the side of the fridge, the side that guests see as soon as they walk into the house. And while the clothes pins look nice when I line them up, they quickly become a mess as the girls take them on and off the side of the fridge to see what they have to do. Considering that I hate having stuff hanging on my fridge in the first place, this was making me nutty. This weekend, I tweaked the system, and came up with something that I really like and it looks nice on the side of my fridge. Win win! The cast of characters – empty check boxes, packing tape, Sharpie, ruler, utility knife, cute scrapbook paper, strong magnets. Step 1: Draw a straight line around the middle of your empty check box. The simplest way would be to draw one straight line around the middle. 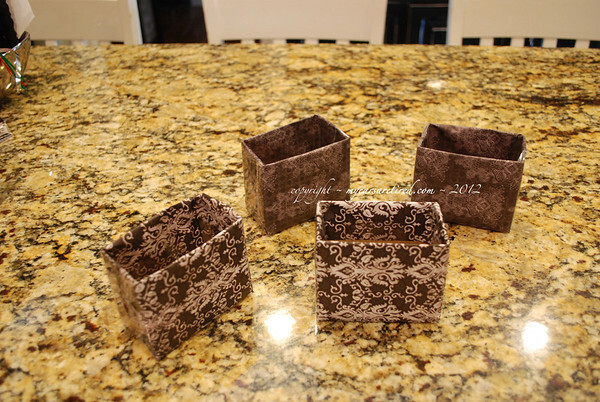 However, I made an error in my first set of boxes and didn’t realize it until they were finished. 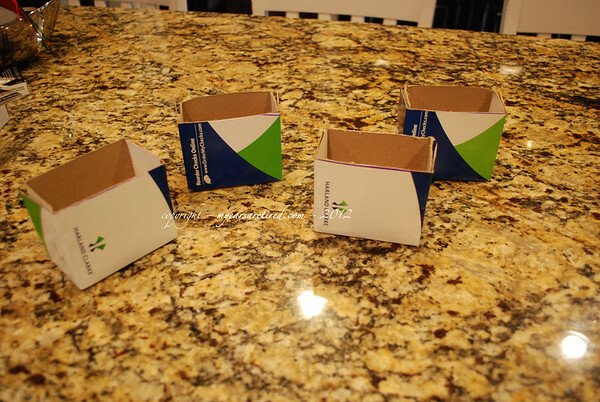 Because I’m picky like this, I couldn’t stand the idea of the boxes not all being the same size. Thus, my need to make two lines around each box. 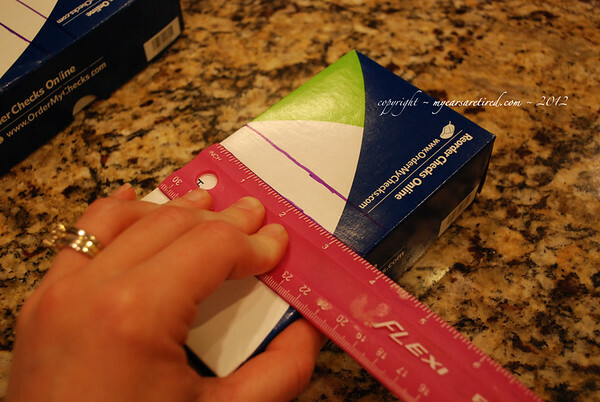 Step Two: Using your utility knife, cut each box along the line you drew. Tape down all edges with packing tape to secure. Step Three: Wrap boxes with pretty paper, just like a present. 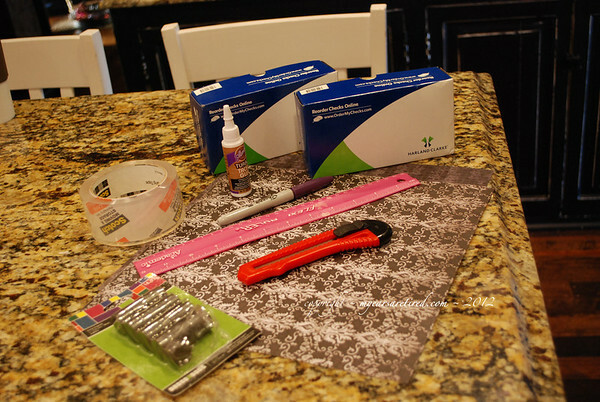 Secure edges of paper with packing tape. 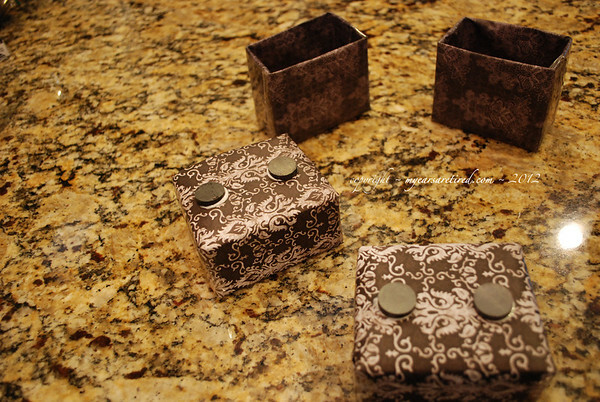 Step Four: Using strong, quick-drying craft glue, adhere magnets to the back of each box. Allow to dry thoroughly before using. Step Five: Fill with chore cards and watch your children take responsibility for their own tasks. To make the cards I went around the house looking for jobs the girls can do or need to do. Some jobs they are compensated for monetarily and it is noted on the card (see photo). Others they do simply because they live here and are responsible for those things. Those cards do not have a monetary amount on them. I made the cards in Word using Avery Label size 5264 and printed them on purple paper that I had leftover from something else with gridlines showing and cut along those lines. I then did a poor-man’s laminating job by coating each one with packing tape. I have since purchased a small laminator for the house. Clearly, that would be a faster and cleaner option if you have one available! How do you keep chores organized at your house? What a great idea. Makes me want to go back and do our “child chores” thing again.